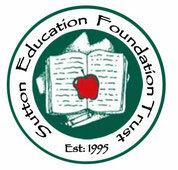 Sutton Education Foundation Trust is a registered nonprofit, 501-C3 organization. The Trust was created to support Sutton Public Schools outside the school budget. The bylaws state that a Trustee must include the school Superintendent and a Principal (alternating school Principals every three years). Volunteers include the parents of Sutton Schools. Meetings are held monthly, or when needed, to review grant applications and raise funds. Trustees and volunteers are not paid for their services to SEFT.